Heat oven to 375°F. Spray cookie sheet with cooking spray; lightly sprinkle with 2 tablespoons Bisquick mix. In medium bowl, stir 2 cups Bisquick mix and the granulated sugar. Cut in butter, using pastry blender (or pulling 2 table knives through ingredients in opposite directions), until crumbly. Stir in egg until soft dough forms. On cookie sheet, roll dough into 12x10-inch rectangle; pinch edges to form 1/2-inch rim. Bake 8 to 10 minutes or until edges are golden brown. Cool 2 minutes. With large spatula, remove crust to cooling rack; cool completely, about 30 minutes. In chilled medium deep bowl, beat whipping cream, sour cream, powdered sugar and vanilla with electric mixer on medium speed 2 to 3 minutes or until stiff peaks form. Spread whipped cream evenly over crust. 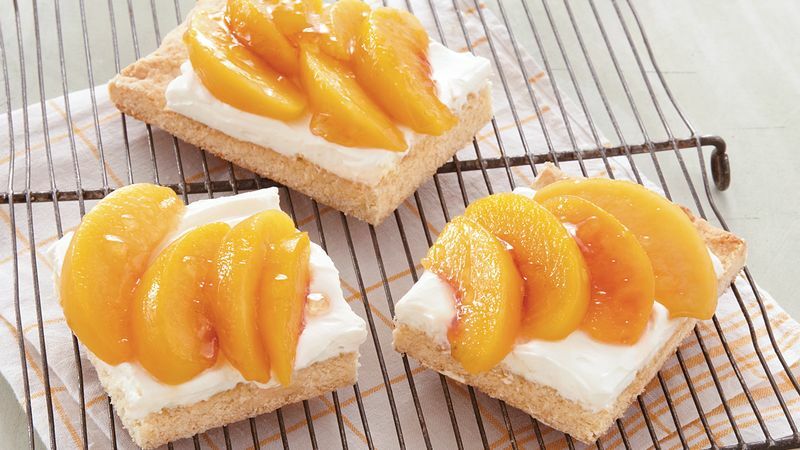 Arrange peach slices over whipped cream. Brush with jelly. Store in refrigerator.